2011 wasn’t just a very solid year for anime. On the anime music front, we were treated to a considerable number of soundtracks and opening and ending themes that left an imprint upon our collective subconscious. While heavy hitters like Puella Magi Madoka Magica’s soundtrack rocked our world with haunting, memorable themes, this year also saw quiet efforts from other composers bubble forth, leaving us enamored with their compositions. Opening and ending themes also saw a mix of old and new artists make their stamp upon the year, with a fine example of both being Triple H’s (new artists) and Etsuko Yakushimaru’s (established artist) work on Mawaru Penguindrum. 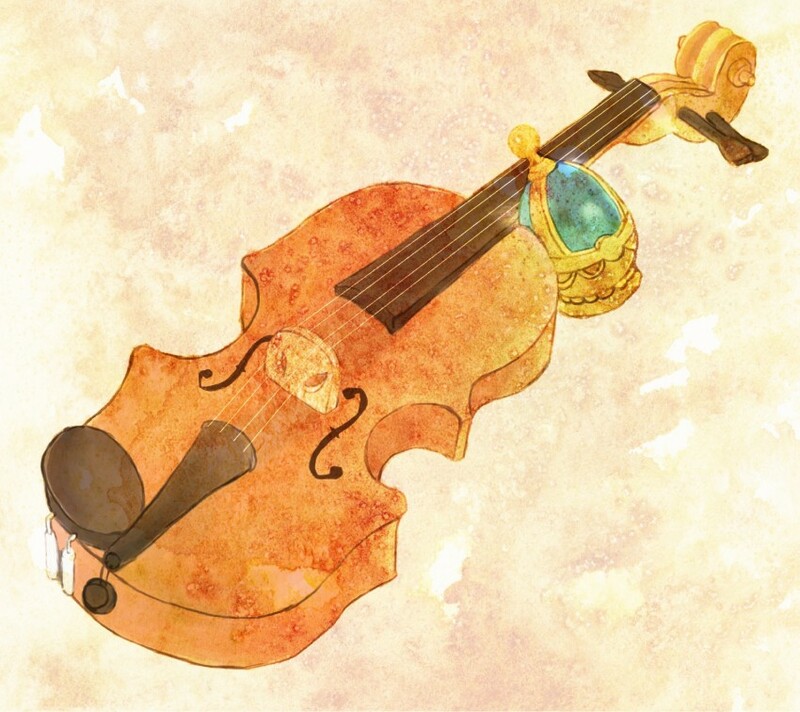 With so much in tow, we at Anime Instrumentality would like to present the first of three articles looking back on 2011 by talking about the best 2011 had to offer musically. 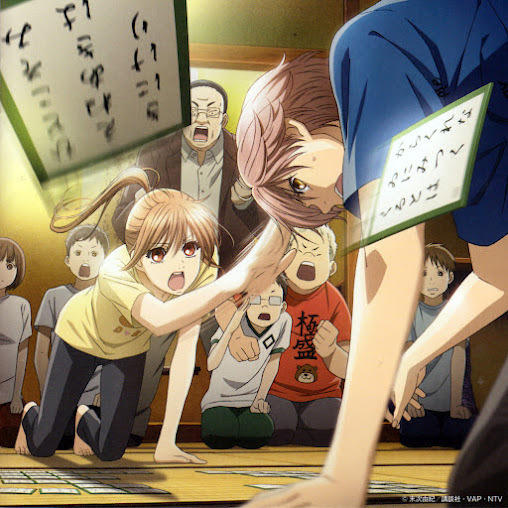 Intensely moving, yet so unassuming in its execution, Chihayafuru’s OST is perhaps the most touching out of all the soundtracks released in 2011. There are no fateful battles, no dark conspiracies, not even any tears of absolute despair. No, it’s just the background music of a show following a group of friends striving to be the best they can be. Nevertheless, the music overflows with the countless sentiments these friends experience as they fight to achieve their goals. In “Karuta Biyori”, a carefree tune striding on clouds, we hear the happiness and high-spirits as they enjoy their time practicing karuta together. On the other hand, the pensive mood of “Osananajimi” shows them quietly reflecting over the physical and emotional challenges that they must face. If there’s any track that sums up the stirring story of the growth this group of classmates experiences, it would have to be, unsurprisingly, “Chihayafuru Main Theme”. Not purely melancholy, joyous, excited or triumphant, perhaps the only way to characterize it would be to describe it as depicting the ebbs and flow of “life.” Perhaps this is the reason why Chihayafuru manages to be so poignant: after all, isn’t “life” something we all can relate to? While last year’s composer of the year was fiercely fought out between Ooshima Michiru and Takanashi Yasuharu, this year’s saw an almost unanimous decision. Hirano Yoshihisa’s works for 2011 were solid to say the least, and stellar if you are all for composers going out of their comfort zones. Hirano’s works with the Break Blade movies showcased his usual orchestral grandiosity. For an anime that was arguably one dimensional, it is impressive how Hirano managed to conjure up a deceptively rich setting through his scores. While the six soundtracks were sufficiently loaded with the sober themes of war and its consequent loss, tracks like the folksy “On the Street” or the humourously-scored “The Fools” added much colour to the OST as a whole. Few Hirano followers would be disappointed, which in itself is a tall enough order, considering that longtime fans use his past works like Death Note and Ouran High School Host Club as benchmarks. But Break Blade alone would not have made Hirano as impressive as he was in 2011. What propelled him above and beyond expectations is his soundtrack for the 2011 remake of Hunter x Hunter. The addition of uncharacteristically lighthearted tracks like “Kijutsushi no Baire” and “All I Need is Money!” to his usual repertoire of orchestra and piano, and his exploration of genres such as rock, Latin and even Celtic is what brought new dimensions to Hirano’s music, making him a composer who is definitely worth keeping our eyes and ears on. Mention Yucca within the context of Japanese music and you’re most likely to be met with blank stares. Not too many know of her, which is a shame, because in Dantalian no Shoka’s opening, her vocals are absolutely sublime, with a beautiful quality that’s very much reminiscent of Kumiko Noma’s performance of “Lilium” from Elfen Lied. Indeed, it’s tempting to compare the two based on the sopranos who feature prominently, but where “Lilium” draws one in by being seeped in sorrow and tragedy, “Cras numquam scire” simply offers a mournful atmosphere that isn’t distraught as much as it is nostalgic. This all stems from Yucca’s vocals, which have a longing, distant quality to them. Her deftness in navigating the lyrics, exemplified in her vibratos and flawless upward movements in pitch, are stirring and touch the listener deeply, urging them to reflect upon the memories of days gone by. The instrumentals, particularly the violin, add to the disconsolate air and together, both voice and instruments mesh together to give “Cras numquam scire” the strong emotional impact that makes it a clear standout among the opening themes that graced 2011. If you’re unsurprised by “For You,” it’s probably because you were expecting no less from Rie Fu. Of the recent artists to have an OP/ED presence, Rie Fu is among the most consistently excellent. She’s been featured in the ending themes for Bleach, D.Gray-man, Darker than Black, and Gundam Seed Destiny, and has impressed every time. Her fifth and latest ED, Hourou Musuko’s “For You,” is our pick for the number one ED of 2011. Though there were tracks that were flashier and more exciting last year (coughRPGcough), few songs could match the clean, honest, old-fashioned songwriting “For You” exhibited. Fu’s voice is simply beautiful; the way she cuts across octaves and flutters in vibrato at the ends of phrases is a talent too infrequently heard in these waters. What this track lacks in pomp and circumstance is made up in spades by good, straightforward singing ability. What a concept. Another thing we have always appreciated about Rie is her English. She is fluent in both English and Japanese, and, to our ears, perhaps more so in the former. This shows in her singing, and her English is among the best we have ever heard from a Japanese artist. This, along with everything else, makes “For You” our best ED of 2011. Note: As always, this feature is but a starting point. So stay tuned for those upcoming articles and like always, we hope you’ll stumble upon a few gems in the anime music world worth checking out. A collaboration between the staff members at Anime Instrumentality to bring you the best of all the anime music out there! Or silliness, whichever it is that happens to come first. Mother of god, I’m not the only person on the planet who loved Dantalian’s OP? I have the same reaction. If I remember correctly, a lot of OP/ED themes got a lot of talk, but very few people were talking about Dantalian’s OP, correct? This flew under my radar too until I decided to review everything that came out just to see if there were any that deserved notice. Wow, I hadn’t heard the Dantalian OP before, but it’s quite something! Also very happy to see For You as best ED. I love that song so much. I downloaded the sheet music last week and I can’t stop playing it! It’s beautiful isn’t it? As I mentioned above, it flew under my radar, but I was glad to have discovered it since more people were caught up with “Oath Sign” and a handful of other OP themes. Yes 🙂 Well… I try! While I certainly agree it was a good year for Yoshihisa Hirano, I think Hiroyuki Sawano came more to my attention this year. With Ao no Exorcist, more Gundam Unicorn, and Guilty Crown I think many are more familiar with him now. For a composer who has only been active for around five years, he shows a lot of promise. I believe you’ve called him “the Japanese Hans Zimmer” in one of your posts and I think I’d agree. Yeah, I can understand that. I probably like their general style of music more than others. Personally I’m not a fan of Zimmer. Past some fairly enjoyable things he did quite a while ago (Gladiator, Pirates of the Caribbean) he hasn’t done anything notable of late. I’d say that this is because all he’s been cranking out are scores that focus on generic epic sound while dropping all attempts at developing memorable themes. Perhaps my acute dislike of Zimmer comes from my experience with his music in musical ensembles. If you’ve ever played in an orchestra and someone tells you that the next piece will be Zimmer, you groan because you know the coming rehearsals are going to be very, very boring. He loves doing this thing where you repeat the same thing over and over and over again for 30 measures. In short, comparing Hiroyuki Sawano to Zimmer isn’t necessarily doing Sawano a favor. Right? Dantalian’s OP was nice but it didn’t “wow” me nearly as much as Penguindrum’s OP. Wait, my tiebreaker vote was for the OST of the year? Nice choices for this year’s best music awards. There were just too many contenders for the OP/ED categories (musically speaking, , but only a few can truly capture the essence of the show and at the same time, evoke good emotions to the listener. And I agree with both Dantalian’s OP and Wandering Son’s ED theme on that perspective. Anyways I’m just going to sit here in my little corner and listen to Ikoku Meiro no Croisee’s OST while you enjoy your music to your Japanese card game show. I tend to have show bias and all when it comes to my soundtrack preferences. I just can’t listen to Guilty Crown’s spectacular soundtrack while not thinking what an UTTER GARBAGE that show was. Then you should be pleased to know that Ikoku Meiro no Croisee did rank pretty high in our internal poll and will be featured in the OST overview post! The nature of our voting system skews the polls toward entries that appear more often versus ones that actually ranked high. In the case of Chihayafuru, it was good enough to appear often in our lists but (personally) didn’t rank necessarily high. The only reason that I don’t think that the Dantalian op deserved to win is because the full song has a random speaking section at the end of it, which ruined the whole song for me. Otherwise, it’s perfect. Great article. I’m glad to see Chihayafuru getting the win for last year. I would say a close second is the Dantalian full score. So many great themes and such a nice feeling all around. Nichijou is another close follow-up with such a fantastic score, at least as presented in the first soundtrack. Then there is the Korean soundtrack to the animated movie Leafie a Hen into the Wild by Lee Ji Soo, fun orchestral music all around. Personally, “Core Pride” by UverWorld, “Nornir” and “How to Go” by School Food Punishment were my favourite Ops of 2011, though I also liked “Connect” by ClariS. My favourite ED would be RPG. Neither of your choices would feature in my top 20, but I guess that’s difference in opinions. Like the Chihayafuru soundtrack a lot, and I think it deserves it’s selection. What did you think about the Ao no Exorcist soundtrack? I though some of the tracks were very good like “Hieiw Kizun” or indeed “eXORCIST”. Just want to add there’s a second Chihayafuru OST as well. Yup, we’re well aware and have begun giving it some listens. Hopefully I’ll have some time to do a writeup on it. Needless to say, I had “For You” as one of my favorite ending songs in the 50 questions thing and of course, the April Anime Music editorial made last year. She is underrated, but I loved her performance of that song since it fits with the theme of Hourou Musuko. Overall, 2011 was a good year for music. Aside from Madoka Magica, there were some great music from Ikoku Meiro no Croisee. For OP/EDs, it was all over the place, although there were some great songs I have heard… but listing them will make the comment to long to read. Is Rie Fu that underrated? I’ve always thought she was well-received by most fans and people might not actively seek out her works, but they like the music she puts out. Croisee did rank pretty highly with any of us and as I’ve highlighted in the review, did result in one of the more relaxing soundtracks to come out of 2011. Copyright © 2019 Anime Instrumentality Blog. All rights reserved.